NWTRCC co­ordin­ator Lin­coln Rice gives a run-down of some of the “Tax Day” actions taking place this year. Anne Barron relates war tax re­sist­ance to Cop­Watch activism. Some notes about the new Qual­i­fied Busi­ness In­come de­duc­tion, the IRS budget request, tax evasion of “gig economy” workers, the ongoing fake-IRS phone scam, and the difficulty of resisting tariffs. Some ideas and resources to help you with your outreach. Announcements on the death of Joffre Stewart, a memorial service for Tom Wilson, the upcoming NWTRCC national gathering in D.C., and stats about NWTRCC’s social media presence. 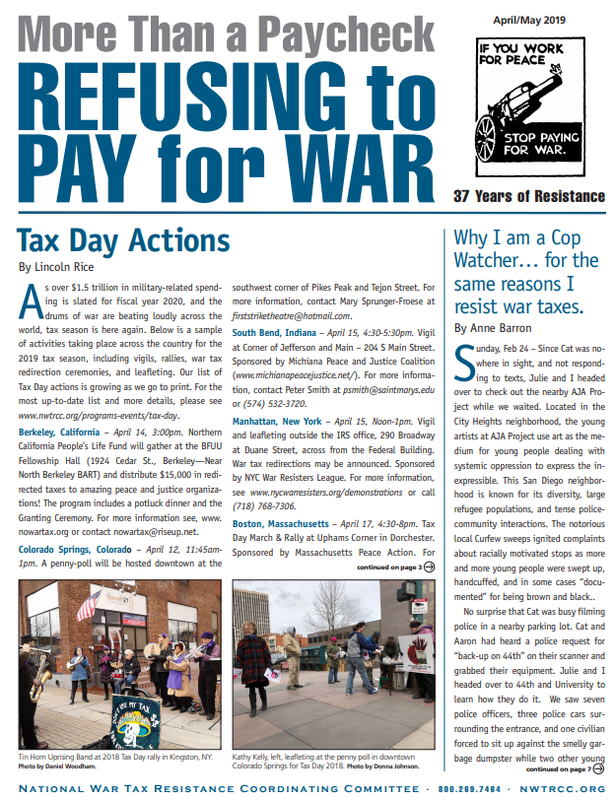 A profile of war tax resister redmoonsong. A new initiative launched with a splash in Catalonia under the name Ni 1 euro x a la repressió (“Not one euro for repression”). Modeled on the Spanish war tax resistance movement, it is urging people to redirect the taxes that would otherwise go to pay for the Spanish monarchy, the judiciary and state prosecutor, and the internal security services. The aim is to stop financial support for the Spanish suppression of Catalan independence. The website is splashy, and its interactive how-to-resist page in particular seems worth emulating by other similar resistance campaigns. Ashley Powers of the New York Times took a long look at the still-thriving “sovereign citizen” movement, and how sovereign citizens leverage their strange mythology to siphon hundreds of millions of dollars from the IRS by filing “frivolous” returns faster than the agency can keep up with them. The epidemic of destruction of automated traffic ticket machines along the roadways of France continues. According to the latest figures, government revenue from these cameras has dropped dramatically. The government believes it has lost €660 million in expected ticket revenue so far, and that’s in addition to the costs to repair or replace the damaged machines.